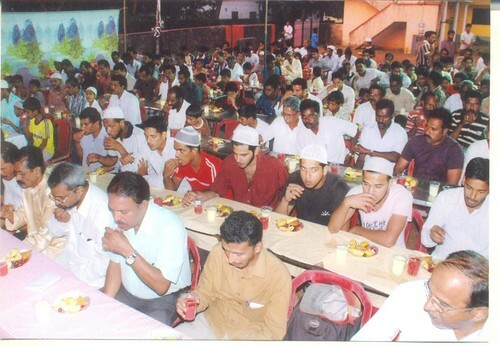 MANGALORE: Administrators of Baikampadi Sri Sarala Dhoomavathi Daivasthana in Krishnapura and the youth wing of Jama’at e-Islami Hind came together to organise an unusual spread of brotherhood and peace. Close to 300 Muslims accepted the invitation to offer prayers and break the Ramazan fast at Sarala Dhoomavathi Daivasthana. It was mainly restricted to slices of fruits and juice, but more than a sumptuous meal it was the spirit behind the gesture that caught attention. At the temple, Hindus and Muslims promised each other that they would strive towards establishing peace. “Humanity, love and brotherhood are the core elements of every religion. If we are truly religious, we must bridge the gap between the followers of different religions,” temple president S Pramod Bhandari said.